After reading a previous review on Yelp!, I decided to put in my "two cents" in. As far as gas stations/convenience stores go, I've seen better. While the place does look a little shabby and most of the products are dated, it's not the "House of Horrors" that the previous reviewer and many others have made it out to be. When comparing it to convenience stores in other crappy neighborhoods in Memphis, it might be somewhat worse because of the panhandlers that loiter there. However, there is a simple remedy for that: IGNORE THEM. Whenever I go there, I don't even acknowledge their presence. So, as far as the overall environment of Amoco Food Express, I just take it for what it is. The real reason for my review was not to either refute or debate the other reviewer, but to talk about the one thing that I love about the place: the food. Assuming that you don't want "burnt shriveled up hash brown potatoes and wings" but instead want something hot and fresh, go to Amoco Food Express during lunch on a weekday (Monday through Friday). This place serves some of best Southern/Soul Food in Memphis, and that's saying a lot. The place serves Southern meat staples such as fried chicken, baked chicken, fried pork chops, hamburger steak and other items. To go along with these, vegetables such as turnip greens, green beans, mashed potatoes, fried okra and rice and gravy are also served. No matter what you get, you'll probably get a very satisfying meal. With the food being this good, I am so glad I found this place. When I initially discovered their food counter, it was completely by accident. I believed this happened on a day when I needed gas to get back to work after mailing something at the post office across the street. When I saw the food counter containing pork chops that looked like my mom used to make, I couldn't resist and got a plate lunch. That meal consisted of some of the best fried pork chops that I've had in a long time. This made a huge impression on me, consequentially making it a prime destination for lunch whenever I'm nearby. By the way, it only offers take-out service, which is fine with me because the environment there isn't conducive with dining. 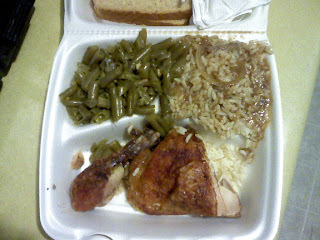 I recently had the baked chicken with green beans and rice and gravy, and it was one best meals that I've had for the week. The baked chicken was seasoned and very tender (so much that the meat falls off the bone) and was moist, not dry. The chicken had just the right amount of oil that made it juicy, but not greasy. I also really liked the rice and gravy, for it was nicely seasoned with just enough salt to make it tasty (I hate it when anything is over-salted). The rice and chicken are a great combination that I highly recommend. For all of its faults, the Amoco Food Express is a great place to get lunch (or breakfast). If you can look past the panhandlers and everything else that gives the place a negative vibe, you'll be rewarded with a great culinary experience.